The inscribed property is situated 10 km south of Jerusalem on the site identified by Christian tradition as the birthplace of Jesus since the 2nd century. A church was first completed there in ad 339 and the edifice that replaced it after a fire in the 6th century retains elaborate floor mosaics from the original building. The site also includes Latin, Greek Orthodox, Franciscan and Armenian convents and churches, as well as bell towers, terraced gardens and a pilgrimage route. 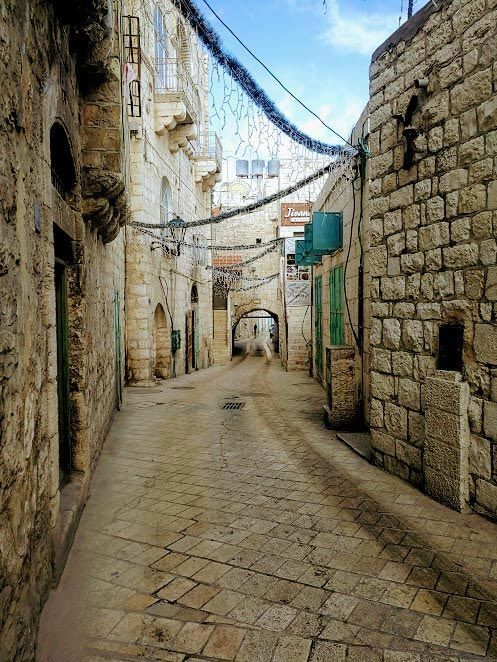 Bethlehem lies 10 kilometres south of the city of Jerusalem, in the fertile limestone hill country of the Holy Land. Since at least the 2nd century AD people have believed that the place where the Church of the Nativity, Bethlehem, now stands is where Jesus was born. One particular cave, over which the first Church was built, is traditionally believed to be the Birthplace itself. In locating the Nativity, the place both marks the beginnings of Christianity and is one of the holiest spots in Christendom. The original basilica church of 339 AD (St Helena), parts of which survive below ground, was arranged so that its octagonal eastern end surrounded, and provided a view of, the cave. This church is overlaid by the present Church of the Nativity, essentially of the mid-6th century AD (Justinian), though with later alterations. It is the oldest Christian church in daily use. Since early medieval times the Church has been increasingly incorporated into a complex of other ecclesiastical buildings, mainly monastic. As a result, today it is embedded in an extraordinary architectural ensemble, overseen by members of the Greek Orthodox Church, the Custody of the Holy Land and the Armenian Church, under the provisions of the Status Quo of the Holy Placesestablished by the Treaty of Berlin (1878). Criterion (vi): The Church of the Nativity, and the Pilgrimage Route to it, are directly associated with the birth of Jesus, an event of outstanding universal significance, through the buildings of which were constructed in the 4thcentury AD and re-constructed in the 6th century AD. These are a strong symbol for more than 2 billion Christian believers in the world; and are Holy to Christians as well as to Muslims. The association of the place that was believed to be the birthplace of Jesus is documented from the 4th century AD and from then on the buildings added to it have been constructed to enhance this religious significance. The majority of the existing church today dates beck to the 6thcentury AD, but retains part of the 4th century floor and some parts of its walls and columns, and have 12th century and later additions that are obvious in the icon painting on the columns of the church. The 12th century additions reflect the Crusades that led to one of the upsurges in pilgrimage activity. The second main component, the Pilgrimage Route, principally Star Street, is part of the Municipality of Bethlehem and is therefore covered by the provisions of ‘Building and Planning Law 30, 1996’, of ‘the ‘Bethlehem Charter 2008’, of the ‘Guidelines for the Conservation and Rehabilitation of the Historic Towns of Bethlehem, Beit Jala and Beit Sahour, 2010, and of the ‘General Rules for the Protection of the Historic Area and Historic Individual Buildings, Bethlehem, 2006’. Protection’, ‘Conservation’, and ‘Rehabilitation’ are the stated objectives of the last two enactments, and the ‘Charter’, which embodies a statement of principles as well as working practices to achieve those objectives. Nevertheless stronger controls are needed to ensure that the urban context of the property is not eroded. This area is now an Area under Planning, and any interventions are forbidden until the adoption the conservation and management plan and the bylaws that are currently being prepared by CCHP in cooperation with Bethlehem Municipality and MoTA.